You need to thaw the ice. -Tap on the rock and stick to transfer them to inventory. 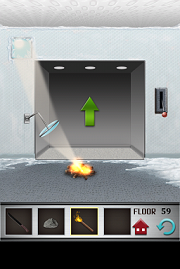 -Use the rock to break the window at the upper left corner to let the sunlight in. -Tap on the mirror until it’s focusing the sunlight on the sticks. This will start a fire. -Tap on the stick that’s in your inventory, then tap on the fire to light the stick. -Tap on the stick in inventory again, then tap on the lever to thaw the ice on it. -Tap on the lever to open the door.